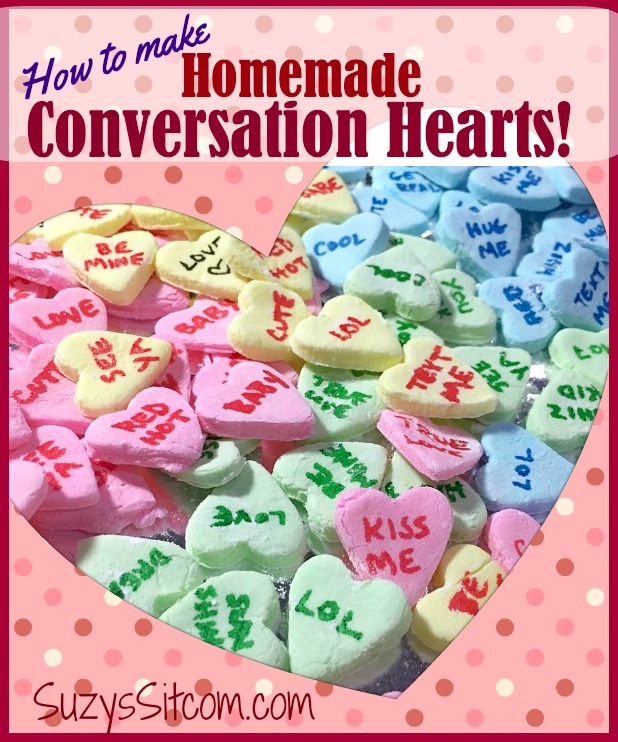 How to make Homemade Conversation Heart Candies! 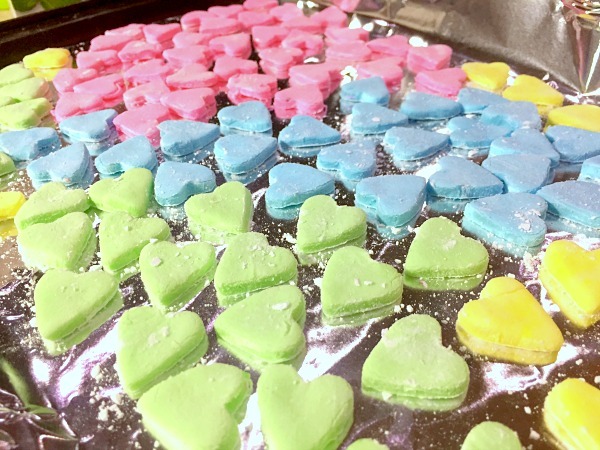 This week, I decided to go into the kitchen and make some homemade conversation hearts. 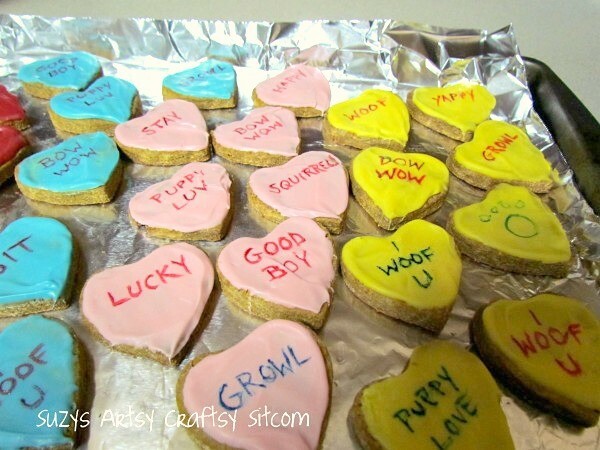 They are easy to make and you can even personalize them! Did you know that Candy Conversation Hearts are unavailable this year? 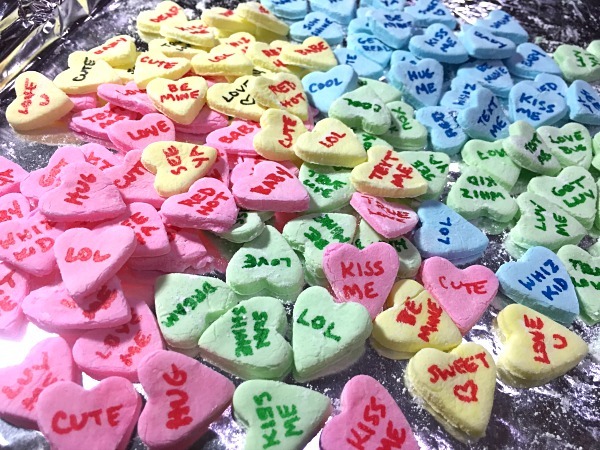 Necco, the candy company that has been making the candy hearts since the mid-19th century, was purchased by a new company at the end of last year. Because of the timing of the purchase, they did not have enough time to set up the manufacturing process for its yearly 8 billion hearts. 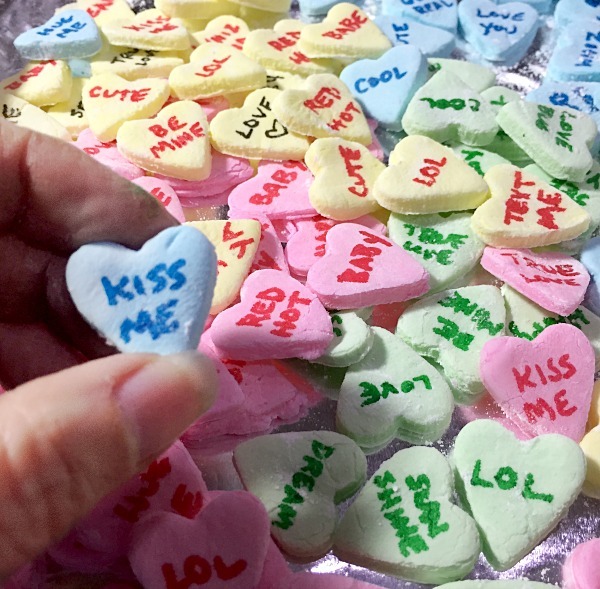 Store bought candy Conversation Hearts will be available again in 2020. In the meantime, let’s make some of our own! Put the corn syrup, gelatin, and water in a small microwave-safe bowl. Stir it well. Microwave for about 30 seconds so the gelatin dissolves, and stir again. 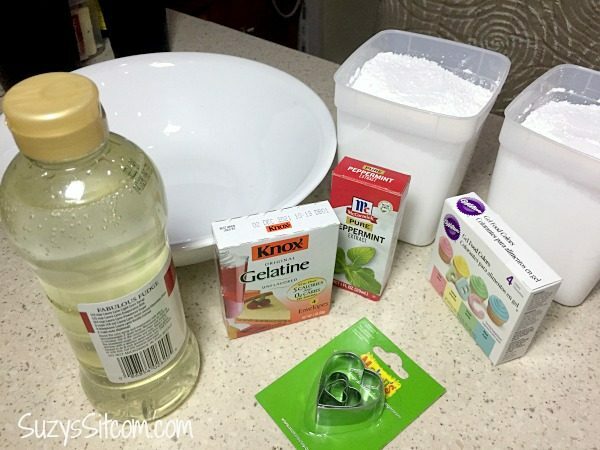 Then pour the mixture into a large bowl and add 1 cup of powdered sugar, mixing it with a mixer on low until the sugar dissolves. Then keep adding sugar and mixing until the full two pounds of sugar are added. This will become a stiff, sticky dough. Use a sifter of powdered sugar to dust the counter and scrape the candy out of the bowl onto the counter. Add lots of extra powdered sugar to the top and start to knead it like bread dough. 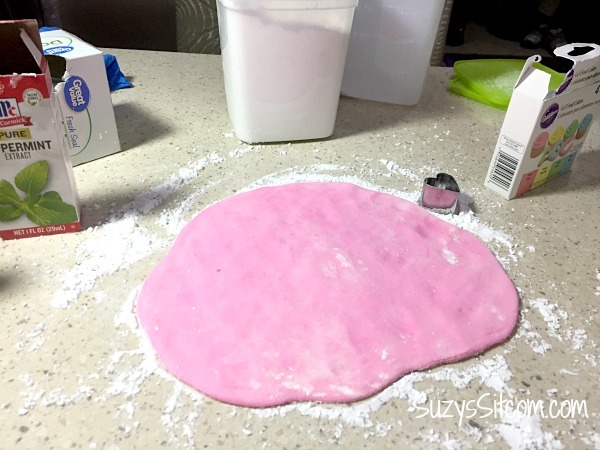 Keep kneading and adding sugar if needed until the candy is satiny instead of sticky. Then decide how many colors you want to make and divide the dough up into that many portions. Take each portion, add a few drops of food coloring and almond extract and knead it until the color is well distributed. (By the way, any flavored extract will work). For this step, use rubber gloves so that you don’t end up with rainbow hands. Repeat this with the other portions until all your candy is colored and flavored. 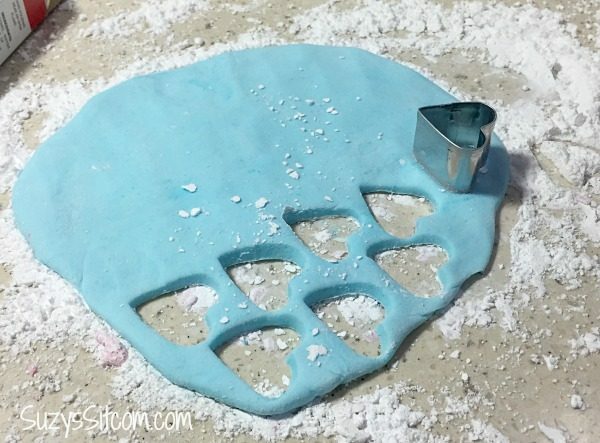 Dust the counter again with powdered sugar and roll out one of the colors to about 1/4″ thick. Then use the heart shaped cutter to cut out the hearts and place them on a sheet of parchment paper. One batch makes a lot, as you can see. 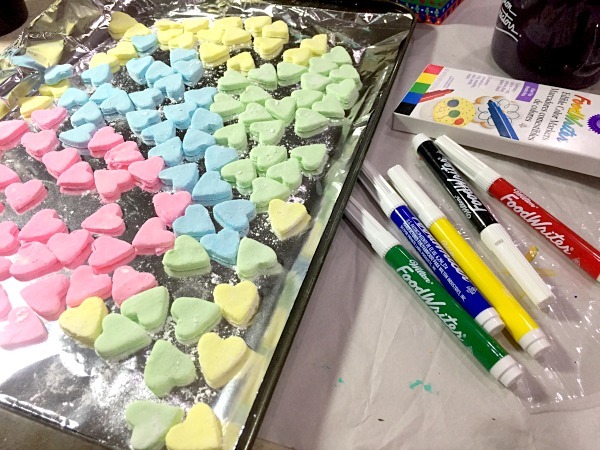 The hearts have to air dry for at least 24 hours before you can write on them. Be sure that they are totally dry before you go to the next step or the ink will run due to the moisture. I found my food coloring markers on Amazon. They are easy to write with and can be used for lots of future projects. If you cannot locate them, you can use a toothpick and liquid food coloring to write with instead. My hearts have lots of personal sayings on them that only my kids would appreciate; Amanda-Panda, Dork, Myers-Tires, and of course the usual stuff like Sweetheart and I love you. What is great about this project is how personal you can make it. The finished hearts should be stored at room temperature in an air tight container. Don’t I sound just like Martha Stewart? I’m wearing my sensible loafers as I type this. Are you new to the Sitcom? Be sure to check out my Frequently Asked Questions Page! 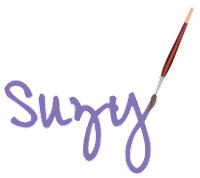 For over 200 crafty tutorials for all ages, visit my Tutorial Page! Next post: Join the Retro Flash Sew Along: Block 4- Bowl! Previous post: How to make Decorative Pens with Polymer Clay!